One burst pipe can result in a major flood that can cause severe damage in a home. In the winter, pipes burst when the water flowing through them freezes over and literally breaks through. Most of this happens down in the basement where there are exposed pipes and it is the coldest place in a home. You should add pipe insulation to any exposed copper or PVC waterpipe. The insulation is kind of like a swimming pool noodle that you can cut to customize around any pipe. Heat rises in a home. The reason we have insulation in our attics is so it will deflect that heat back into the house. Just because you have insulation in your attic doesn’t mean it is still effective. Over time, that insulation can wear thin. This is will often happen in attics that are more crawlspace with exposed insulation. This is one of those projects that is probably best to turn over to a professional. Speaking of professionals, you should also have the appropriate ones check out the furnace and chimney. Both of those areas should be thoroughly cleaned and checked for any damage at least once a year. The last thing you want to have happen is your furnace going up on a cold winter night. If that furnace has crossed over the 10-year anniversary mark, then you might want to start thinking about replacing. 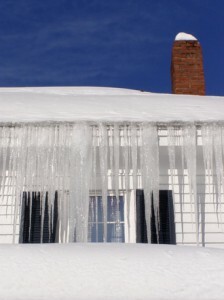 Icicles might make for an interesting picture but what they are demonstrating is that your rain gutters are clogged. That in turn can create problems if some of that water were to seep into your roof. Depending upon how many leaves are left on the trees, this might be a task you have to do a few times. You probably shouldn’t be watering your lawn much throughout the winter. If you have sprinklers, then they should be drained out and shut off to prevent freezing. It’s hard to imagine a winter in Canada without snow. The question then becomes, “how much snow?” To make sure a heavy snowfall won’t be too disruptive, try to mark your walkways and driveway with snow poles or other markers that will stand out. If you can incorporate them into holiday decorations, then all the better! It will also help if you get rid of the rubbish around your yards and storage areas. Outside, it’s an issue for the snow again to make sure it is not covering up junk that can become a hazard. Inside, it will be better if your garage, closets and basement are free of rubbish. That just makes keeping things organized much smoother. For this task there is another set of professionals that you can hire: Junk Works. These are the junk hauling experts who will dispatch the team of dedicated movers and a big truck to your home to haul away just about any item you want to get rid of regardless of size or weight. Think of what a positive impact that will have around your house. When getting your home ready for winter, be sure to add a session with Junk Works to the agenda. This entry was posted in House Cleaning Benefits, House Cleaning Tips and tagged junk, junk works, rubbish, snow, winter on November 29, 2018 by Junk King. Last updated November 29, 2018 .